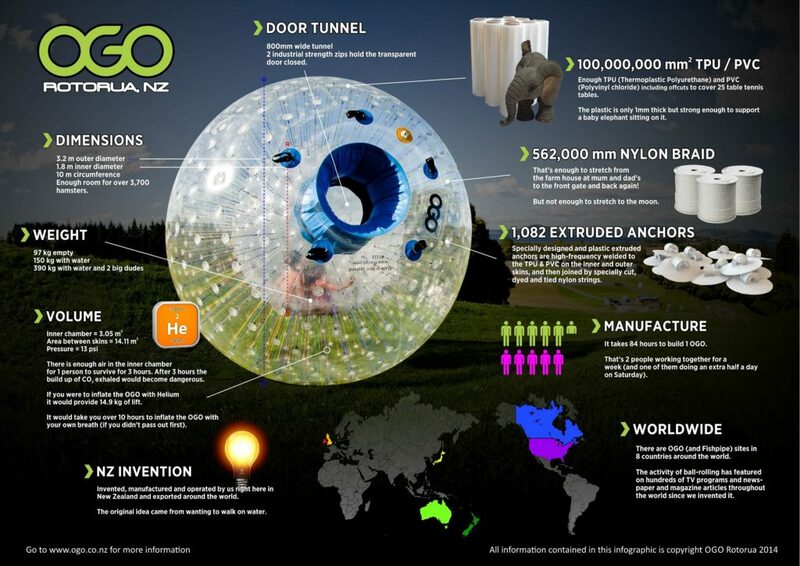 The OGO ball is an iconic – and rather quirky – New Zealand adventure activity. Invented by two true-blue kiwis, Andrew Akers and Dwane van der Sluis, the activity of ball rolling is now an awesomely fun global phenomenon. Rotorua is still the only place in New Zealand where you can roll down a hill in an inflatable ball. It sounds pretty crazy, and it definitely is out of the ordinary! Here are five things you didn’t know about our very special OGO balls. 1. How long do they last? We use a total of ten OGO balls at any one time here on our site in Rotorua. This includes our H2OGO balls and our specially designed DRYGO balls. After about a year the UV rays and general wear and tear causes the OGO balls to cloud up and look yellow in appearance. Even though they are perfectly fine to use operationally we prefer them to look nice and shiny! We also keep a couple in storage for off site events (such as school galas and trade expos). The old OGO’s go on to live a second life and are recycled into soft rubber matting for children’s playgrounds. 2. Where are they made? The OGO’s are designed and manufactured in our onsite factory here in Rotorua, New Zealand. Our Rotorua factory currently employs three full time staff. The factory produces around 30 OGO balls and 15 Fishpipes a year. The OGO ball and Fishpipe aren’t just used here in Rotorua. These are exported all over the world to places such as Germany, Australia, Canada and Hawaii – pretty impressive! 3. What else do you make? As well as manufacturing OGO balls, the team in our factory also construct Fishpipes. Invented by David Akers in 2009, the Fishpipe is the world’s first rotating barrel ride. Shaped a little like a rugby ball, the inflatable Fishpipe barrel sits on a steel frame and simulates a wet ride going down the hill. The Fishpipe rotates up to 45 rpm by a custom made electric motor and lasts for two minutes! Read more about the Fishpipe here. While we don’t have a Fishpipe on our Rotorua site; we have sent them to various waterparks and resorts around the world. An OGO ball takes a total of 84 hours to make. Each step of the OGO ball manufacture is done completely by hand. The OGO ball is constructed using various plastics and materials. Most of which are sourced here in New Zealand. For the inner and outer skins 100,000,00mm2 of Polyvinyl Chloride (PVC) and Thermoplastic Polyurethane (TPU) is used. This is enough plastic in total to cover 25 tennis table tables. The plastic is 1mm thick, however it is strong enough to support a baby elephant. A total of 1,082 extruded anchors are high frequency welded to the TPU and PVC on the inner and outer skins. Once the anchors are attached to the inner and outer layers they are tied together with rainbow coloured nylon strings that are hand cut and dyed. 5. What if I don’t want to get wet? Another crazy invention by the team here at OGO Rotorua. The DRYGO has been specially designed to simulate a wet ride on our Straight or Sidewinder track. You don’t flip upside down or get dizzy! The DRYGO is a small OGO placed inside an OGO with water in between. OGO Rotorua is the only ball rolling operation to offer this dry ride option for guests. Epic fun, we promise.